Stems: Slender, spreading, weak, often branched from base, glabrous or slightly hairy at base. Leaves: Alternate, stalked, pinnately divided more than once, fern-like, glabrous; leaflet lobes oblong, blunt; upper leaves smaller, nearly sessile. 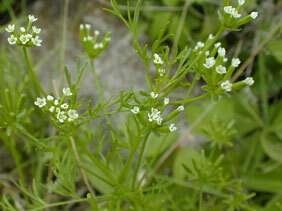 Inflorescences: Umbel, compound, simple or with 2-3 rays; rays 1 to 2 inches long in fruit; flowers 3-10 per umbellet. Flowers: Tiny, white; petals 5, tips bent inward; stamens 5. Fruits: Narrowly oblong, 1/8 to 1/4 inch long, wider at or near middle, glabrous or rarely hairy, ridged; ribs on fruit narrower than the spaces between the ribs; stalks thread-like, of uniformly thick. Habitat: Open woods, thickets, stream banks, and roadsides; moist, alluvial soils. Comments: The name chervil is said to be derived from ancient Greek chairein "to rejoice" and phyllon "leaf".